It’s safe to say that Ridley Scott knows his way around a camera. From Alien to Gladiator, the director has brought to the silver screen some of the greatest films of all time, heck even Prometheus wasn’t that bad in a muddled kind of way. Now, after the underwhelming Exodus: Gods & Kings, Scott returns to the director’s chair doing what he does best, sci-fi. But is The Martian as good as his earlier works? Thankfully, the answer is yes and The Martian proves how good the director can be when he’s given the right material to work with. Andy Weir’s 2011 novel of the same name lends a good starting point and Scott ends up with his best film since 1979’s masterpiece, Alien – that’s no joke. 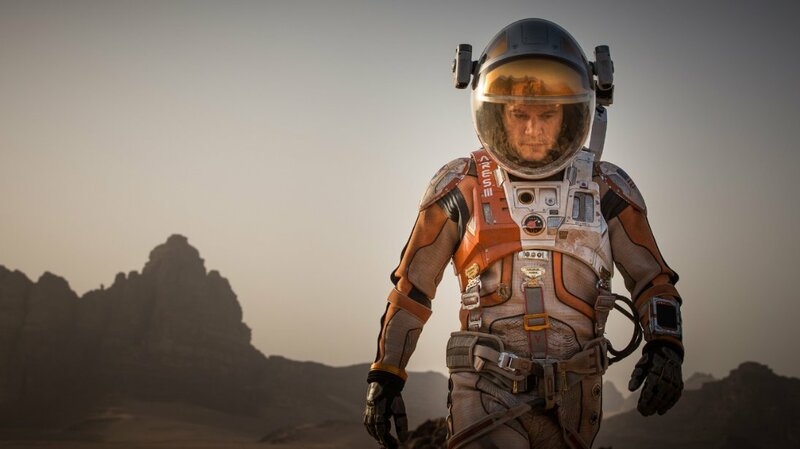 Matt Damon stars as Mark Wateny, an astronaut and botanist left stranded on Mars after a mission goes horribly wrong. After being left behind by his colleagues, played by talent including Jessica Chastain (The Hurt Locker) and Kate Mara (Fantastic Four), Mark must find a way to survive on the red planet until a rescue operation can reach him – years later. Sean Bean, Kristen Wiig, Donald Glover and Jeff Daniels also star as NASA directors, scientists and astrophysicists. Despite their limited screen time, each brings something to the table with a spirited performance. Matt Damon. Copyright: 20th Century Fox Film Corporation. Scott directs The Martian with a huge amount of confidence, clearly helped by his time on Alien and Prometheus, and his cinematography is absolute perfection. Never has Mars looked this good on film. The desolate, arid landscape is breath-taking and the numerous aerial shots that feature Damon’s character only add to the emptiness. The special effects too are wonderful. CGI is mixed with amazing practical props that integrate so well together that it’s impossible to tell the difference. The numerous spacecraft, living quarters and vehicles all feel so real and continue to add more credibility to The Martian’s cause. Damon is also second-to-none and over the course of the film develops new personality traits, all due to the intense stress of being stranded 50 million miles away from Earth. The film lives and dies on his efforts and thankfully, the ever-reliable actor gives one of his best performances in years. Unfortunately, Jessica Chastain doesn’t have too much to do until the finale and feels a little side-lined – she has won an Oscar after all, though Damon’s magnetic presence is enough to forgive some of the shortcomings in other characters. The script is, on the whole, very good indeed. Despite only featuring one character for the majority of its 140 minute run-time, The Martian is funny, witty and helped by a fantastic disco soundtrack that has hits from the likes of ABBA dotted about. Overall, The Martian is sci-fi film-making at its peak. Ridley Scott has crafted a beautiful looking and deeply involving film that features the very best in special effects and scientific accuracy. 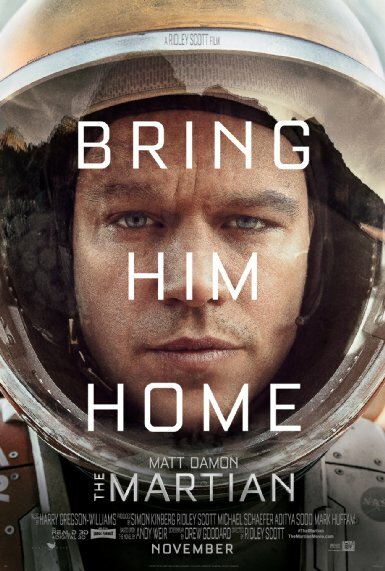 With Matt Damon’s dry humour and emotional depth, it’s a winner all round. I really hope you enjoy it. Please come back and let me know! I thought it was fantastic! Ive reviewed it too. One of Ridley Scott’s best!